You have troubles parking your car near Aziz Supermarket. The stores are cramped together just like the pavement in front. The lighting is bad and there are too many people swarming around. You climb the steps wandering, not window shopping, but wandering. You reach the second floor, while asking yourself why you are here. And then the sign in the corner catches your eye. It's not so much a sign as it is a massive wooden headboard for a shop- created out of recycled material. The garbled, knotted material sporting one red word: Deshal. You walk in, in a trance. The walls are plastered with old newspapers, out of which newspapered faces pop out, here and there, eerily. You barely work yourself out of a trance when other sights assail you. The cave paintings of Lascaux. The scenes out of an Egyptian crypt. Folk art. But they are not replicas. In fact they aren't paintings at all. For Deshal doesn't sell paintings. Deshal sells art on fabric, on clothes. And these scenes are none other than screen-printed on fatuas. Deshal opened on 10 April 2005 with a determined aim to promote anything and everything local. Hence they started with the name that quite predictably derives from the word "deshio" and everything they sell is undoubtedly local. With the design team comprising of nearly a dozen designers who are all Fine Arts graduates, it is no surprise that the clothes at Dehsal primarily sport artwork on them. The fatuas are made in a Dhaka-based factory and the fabric comes from other parts of the country. The shop now specialises in fatuas made of khadi from Comilla. In future they plan on using fabric from Noushingdi too. Deshal also sells scarves, glass bead necklaces and wooden-metal wall mounts too. And the best part is their prices. All fatuas range from Tk 280 to Tk 320. The necklaces cost Tk 30; the scarves range from Tk 130 to Tk 160 and the wall mounts cost Tk 800. And if a fatua doesn't fit, they'll try to provide you with a fitting size if the fabric is available. In future Deshal plans to sell jholas, cellphone pouches, painted wooden bangles and glass bead anklets and bracelets. In a market that has been saturated with common designs, Deshal's innovative effort to create something unique is commendable. Still reluctant to visit Aziz Supermarket? Visit Deshal and see if it changes your mind. Their address is 124/a, 2nd Floor, Aziz Co-operative Supermarket. It isn't everyday that a new magazine is launched. And when one is launched, the launching party should be an extravagant affair, like the launching party of Canvas, a new Bengali lifestyle magazine. Canvas was launched on August 1, 2005 at the Sheraton Winter Garden. The event began with Canvas' managing editor Shakhawat Alam Rono describing the magazine and its various aims. He then left the floor to Kaniz Almas Khan, the editor of Canvas. She introduced the Canvas team and expressed her gratitude to everyone who was involved in making the magazine a reality. Finally, amidst a lot of fanfare, the magazine cover was unveiled with celebrities Mona Lisa, Tinni, Tisha, Romana and Sweety adorning the stage in the same outfits in which they adorned the magazine cover as well. On a more serious note, the magazine was then unveiled by Noorjahan Begum, the editor of Begum the oldest magazine for women in Bangladesh. Noorjahan Begum spoke a few words regarding Canvas. With the formalities completed, it was time to begin the entertainment. It began with Mahmudduzzaman Babu singing "Ami Banglay gaan gaai". After the song there was a cue of models in Jamdani saris walking the ramp to the tune of a Tagore song. Shahrukh Amin, the Style Editor of Canvas, choreographed this scene. This scene was a tribute to Bangladeshi heritage. When the scene ended, singer Tonima Halim came on stage and sang a song that was written and composed by Ayub Bachchu. Following Halim's song, there was a dance sequence, after which Ayub Bachchu came onto stage himself. He sang, "She could be a princess", which was composed by Bachchu himself and written by Bappi Khan. The song was accompanied by another western wear scene were models wore designs by Shahrukh Amin. Bachchu left the stage to a salsa performance after which three generations of singers, comprising of Shubir Nandi, Fahmida Nabi, Bappa Mazumdar, Kaniz Shuborna, Sunbeam and Elita came onto stage to sing the Canvas theme song. Golam Murshed wrote this song; Shubir Nandi gave the tune and Ayub Bachchu did the composition. It was a night of many firsts. It was a night that marked the end of a very well organized and successful launch party. It was also a night that marked the beginning of a new journey. The journey of a new magazine: Canvas. This is a terrific gift item for tea or coffee guzzling motorbike enthusiasts. It's a large mug with the Harley Davidson logo embossed onto the side. The mugs are generally black and come in slightly different styles of artwork. If sipping is not your game then it can always serve as a penholder. If nothing else then it will help collect all the leaking oil from your first cheap second hand motorbike. The mug is a bit expensive though if used for the last purpose but looks downright cool. Available at Archie's in Kamal Ataturk Avenue for 400-500 taka. Footballs and basketballs lose air very easily when left lying around or being kicked about. You would lose air too if faced with similar consequences. Flabby balls are no good for games except when you want to hit someone indoors. It's less bouncy and won't break the priceless cheap decoration pieces. To pump them up get a literally handy pump that is about six inches long. At 75 taka it is relatively inexpensive and is available at Meena Bazaar. You can buy it from sports stores in Stadium Market for about 50 taka. Even though it might be tempting do not use on humans or furry animals. Dart games are fun but leave a mess. You throw a dart and invariably you will hit the wall or door behind making it look as if Woody Woodpecker has gone insane. Sometimes darts 'accidentally' end up near the family pet or an annoying sibling/friends buttocks. At Meena Bazaar you will find magnetic boards that are technically not boards. These are flappy, flexible mats that can be rolled up to be stored in a cylindrical case. 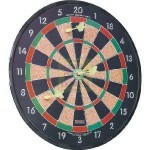 You just hang it up against a wall and throw your magnetised darts. The price is 475 taka and make sure you check it out properly before purchase. Public Speaking and/or Presentations have become almost the norm these days. Recent research shows that even if the aforementioned is the case people would more willingly jump off a plane than embarrass themselves in public. That need not be the case however. Here are some simple tips that will help turn you into a magnificent orator or something like it. Don't think "How can I survive this?" Think how can I do this brilliantly? It's essential that you are positive and self confident about yourselves. Don't be so to the extent of being cocky but just enough so that the audience knows that you have complete faith in your own abilities. Also try preparation and speaking in front of a mirror- it works. Eye contact is a vital aspect of being in charge. But its important to do just the write amount. Don't stare, just make confident eye-contact and make the audience feel that you know he is there and listening to you. Don't be a drill sergeant- be friendly and try to make the audience feel welcome. This will ensure that they make you feel the same way as well. Vary your voice tonality and speed during your presentation. Convey energy when you need to, and slow down to 'draw them in close' when it's appropriate. Its never nice to give a presentation or a speech without any expression whatsoever. It's possible for public speaking to be fun and hugely satisfying. Once you've enjoyed a presentation, or even part of it, your self-confidence will get a huge boost and you'll be off and running! Give yourself the best chance by using the exercises and tips on this page. Good luck!